Samuel Obeng Amoako, 28, won the monthly prize of GHȼ30,000, while GHȼ10,000 and GHȼ5,000 went to Baba Ibrahim and Belinda Boahene who placed second and third respectively. Obeng Amoako, who was full of joy, was presented with his cheque at a short ceremony in Koforidua in the Eastern Region over the weekend. “I was simply dumbfounded when I received the call from Vodafone. I didn’t know whether to shout, be quiet or start jumping,” he stated. Mr. Obeng, a social worker at the Department of Social Welfare in Accra, said that his constant streaming of movies and series made him buy a lot of credit. Baba Ibrahim and Belinda Boahene said that they were aiming for GHȼ100,000 cash prize in the grand draw. 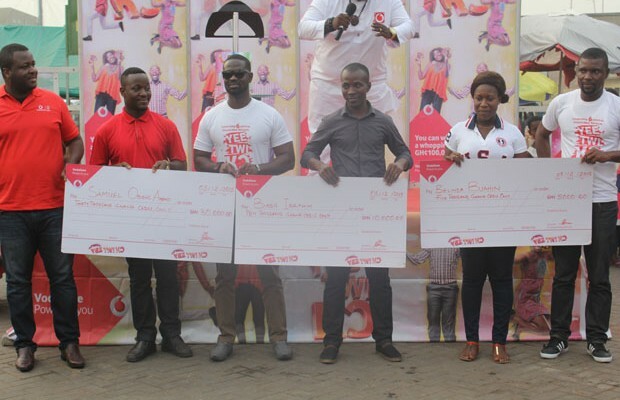 Martison Obeng-Agyei, Head of Mass Market at Vodafone, said his outfit had increased the number of winners from 170,000 to 272,000 for more customers to benefit from the promotion. The event was attended by Mark Hayford, Regional Manager at Vodafone, Michael Lartey, Commercial Director at Vodafone for Eastern Region and other top officials at Vodafone in Accra.